• This is our adjustable arc-shaped folding sit up bench. It will make workout more defective. 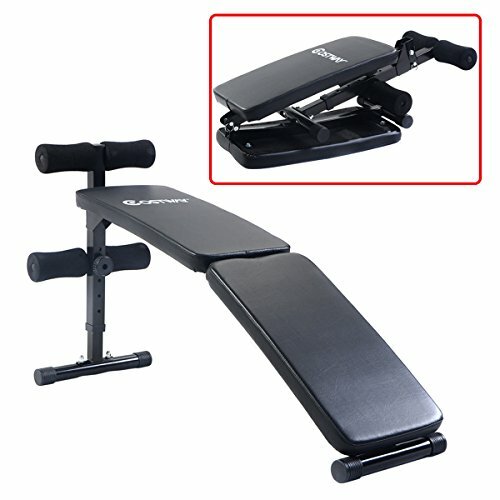 With ample padding and heavy duty steel construction, this sit up provides stability for exercise and fitness. The height can be adjusted from 22 to 27.5 inches. The two pieces pads are convenient for using and folding, which will save space for your gymnasium. It is ideal to more easily emphasize lower abdominal muscles and the ABs you want. Welcome! Note : Simple assemble is required according to the included instruction(hardware included). • Thickness of each pad: 1.57"